I must tell you that this Salley Mavor give-away has been one of my all time favorites. I loved reading every single one of your comments, and I'm sure she did, too. It was so fun to hear how super thrilled some of you were to discover that your favorite artist had a new book out, but I especially enjoyed the many awestruck comments of readers discovering her for the first time. Her work truly makes you feel as if you stumbled upon a bit of magic. One little tidbit came up enough times that I wanted to take a moment to clarify... some of you were so sweet to think that Salley had been reading my blog all along. Nope, I believe I was just another anonymous fan until last week when a little bird told her to stop by. Google Alerts is a wonderful online service that you can subscribe to for an instant heads up when key words are being used on the web. You can type your name, your blog, your favorite whatever and Google will send you an e-mail whenever it shows up somewhere... anywhere. The power of Google: helpful, powerful, and a little unnerving. So anyways, I knew you would agree... Salley is marvelous in every way. When asked to give a signed copy of her beautiful new book (Pocketful of Posies) to one random reader, she didn't hesitate for a moment. Wow! A scrumptious gift! What an incredibly talented woman! Thank you so much for sharing!! Please get in touch with me so that I can pass your mailing info on to Salley. For the rest of us, on to the wish list it goes... or in my case- just waiting for it them to arrive! 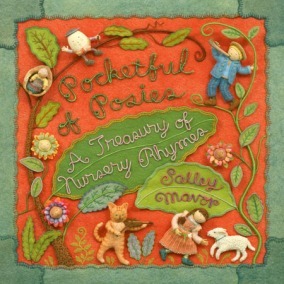 I ordered several of Salley's books last week! 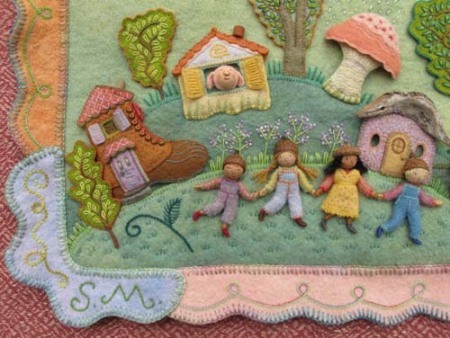 ok, so i'll just try and not be too jealous...i feel exactly the same way you do about salley's work...my tattered wee folk book always a fav. too... i'm so very tempted to find a way to see her traveling exhibit...i can only imagine my heart would stop beating seeing her work from the book in real life, up close and in true colors. oh wow! I don't have any children so is it wrong of me to want one of these books for myself?? I mean the nursery rhyme one!